The analysis screen is the final step in the range prediction process and displays the results obtained from running the propagation and reverberation loss models using the data supplied in the Sonar Editor, Main Screen and Environment Screen. Top left is the Probability of Detection diagram (PODgram) which provides a colour coded summary of sonar ranges against targets at different depths. Ranges are presented as % Probability of Detection – 25%, 50% and 75%. The X axis corresponds to distance along the track set on the Main Screen. 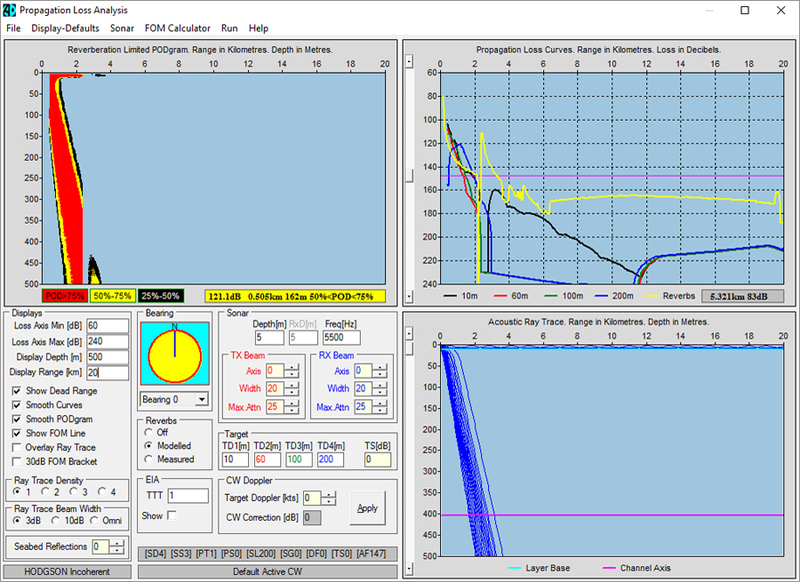 This panel can be changed to display a best source depth for the sonar, intensity distribution chart & overlay EIA data. Top right shows the propagation and reverberation loss (in yellow) curves for four target depths. We believe that the use of reverberation loss curves is a unique WADER feature and allows a direct comparison between received propagation loss and reverberation. Bottom left is the control panel where a range of parameters may be modified such as frequency, target depths, sonar depths and beam patterns. In addition the effect of reverberation may be evaluated by turning the embedded reverberation module off. Bottom right is the acoustic ray trace with separate traces for the transmitter and receiver. Note the slider controls at the side of the ray trace. These can be used to change the transmitter and receiver depths and produce a real time ray trace update. The PODgram updates when the mouse releases the slider control. When combined with the layer depth and channel markers, this provides a powerful tool in both operational and teaching environments.